Climate change is a global emissions problem. California produces about 1% of the world’s greenhouse gas emissions. Over the next few decades, the majority of emissions will come from developing countries. If we don’t solve the problem in the developing world, we don’t solve the problem. The world is making negative progress on climate change. Evidence of the potential for drastic climate change is growing, but worldwide greenhouse-gas (GHG) emissions and concentrations of GHGs in the atmosphere are still rising. Exxon’s just-released Energy Outlook, predicts world oil consumption will rise 19% over the next 25 years, while natural gas will rise 66%, and coal will be flat, no decline. 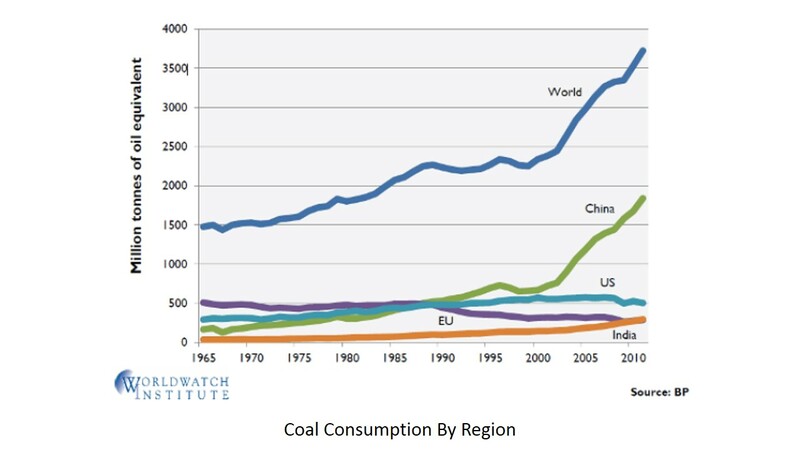 Nearly all of this was known back in 2006, when California passed the Global Warming Solutions Act, though the massive growth in China’s coal consumption was just getting momentum. Back then, the argument for California emissions targets was “leadership” and that is still the word one hears most often from defenders of the state’s current package of GHG markets and mandates. There is something to each of these arguments (well, maybe not #3. Most economists think addressing climate change will be a small drag on the economy—if you don’t count the worldwide economic value of averting climate change). But it’s 2014 now. The U.S. is further from adopting a price on GHG emissions than it was in 2006. Fewer members of Congress than 8 years ago even believe climate change is a problem. The three largest market mechanisms for reducing GHGs (California’s cap-and-trade, the EU-ETS, and the eastern U.S. RGGI program for utility emissions) all have very low prices that are doing little to change the course of emissions. For these reasons, I think it’s time to have a frank review of California’s climate policy. We need to refocus on how California can realistically contribute to solving the problem of global climate change. Reaching emissions targets for California may be part of that strategy, but that should not be the singular or even the primary goal. The primary goal of California climate policy should be to invent and develop the technologies that can replace fossil fuels, allowing the poorer nations of the world – where most of the world’s population lives – to achieve low-carbon economic growth. If we can do that, we can avert the fundamental risk of climate change. If we don’t do that, reducing California’s carbon footprint won’t matter. Focusing on solving global climate change would mean that a major test of any policy proposal would be whether it is exportable to the developing world. It’s always hard to predict what will work, but “working” in California isn’t particularly valuable if the approach doesn’t work where most of the planet’s emissions will be coming from in the 21st century. GHG-reduction strategies that are very expensive – but bearable for a rich country – only make sense if they have a plausible path for getting to near cost competitiveness in poor countries. That means less emphasis on numerical measures of California emissions and more emphasis on learning. What more are we likely to know at the end of a program and will that knowledge be applicable in other parts of the world? In procuring renewables, California’s current “least cost, best fit” approach should be augmented with “most learning.” That means a new technology about which we (and the rest of the world) will learn a lot may get funded even if it is likely to be more expensive than replicating a mature technology. We need greater emphasis on technology creation, both in the lab and downstream, where a lot of the learning goes on. California should consider creating a Climate Change Solutions Institute akin to the California Institute for Regenerative Medicine. The goal would be to research and develop approaches that could be applied by a large share of the world’s population. Every California energy efficiency program needs rigorous evaluation of what worked and why, and what didn’t work and why not. And we need to study where else in the world the same sort of efficiency policies would (or wouldn’t) be effective. The greatest value from the state’s energy efficiency leadership is likely to be knowledge creation, not GHG reduction. This does not mean California should abandon pricing GHG emissions. Putting a price on emissions helps boost green technologies across the board. In addition, substituting cap-and-trade revenues (or GHG taxes) for income or sales taxes is a clear move towards improving economic efficiency and welfare. California’s current strategy may eventually allow us to say “we’ve done our share; now the rest of you need to step up.” But that isn’t leadership when more than 80% of the “rest of you” are living at less than one-quarter of our standard of living. It’s time to make our Global Warming Solutions Act about global solutions. Great article, and timely given the revision of the AB32 Scoping Plan. In addition to technology transfer what about carbon pricing institutional transfer? So far the carbon prices have been low because so many allowances are given away for free. California should increase the amount auctioned, and then increase the amount returned to households. Spending all those funds on high-speed rail would set a terrible precedent for prioritizing the Governor’s whims over cost-effectiveness or addressing regressivity. Returning revenues to households equally (Cap and Share or Cap and Dividend) coupled with Contraction & Convergence is a good way to appeal to the other 80% of the world. I am conflicted on this. What seems to have happened in the USA, generally, is that we’ve taken no helpful actions and continued unhelpful use of fossil fuels (FF). Sure, we argue that we cannot solve the global problem alone and that going for “leadership” puts us at an economic disadvantage by comparison with other race-for-the-bottom (race-for-disaster) countries. But also, clearly, we should be leaders at funding research and development of new technologies EVEN IF THE EARLY ONES ARE NOT ULTIMATELY THE BEST because one must start somewhere. If states (and federal) government began the swuitchover away from FFs, they’d spend a lot of money EARLY that they might regret later when technologies are cheaper, but government spending would be a good pump-primer for R&D. On the whole, I advocate government spending to eliminate use of FFs by government, even government competition with corporate enterprise if that’s what it takes to get the ball rolling. Saving the planet should not be regarded as a game of “chicken” where the USA refuses to act (and California refuses to act) unless and until all OTHER major players join in. Better to roll up our sleeves and get started.